A great way to find inspiration for the bride’s hairstyle is through the movies. All you have to do is rent a couple of bridal movies and seek inspiration for the wedding, especially for the bridal hairstyle. Whether you’re thinking about wearing your hair up, down or very casually, there are tons of ideas! Here are 8 famous movies that many brides are inspired by to create their own bridal hairstyle. Have fun! 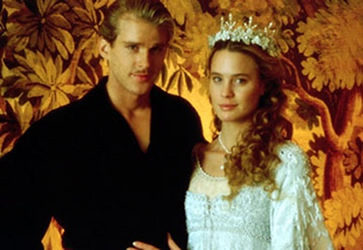 This romantic movie from the 80s relays the regal romance of a princess bride. The bride’s hairstyle, played by the beautiful Robin Wright, consists of grandiose curls, large and soft, all of which are complimented by a crystal tiara with diamond floral adornments. For a romantic bride who dreams of being princess for a day, it’s hard not to fall in love with this hairstyle. 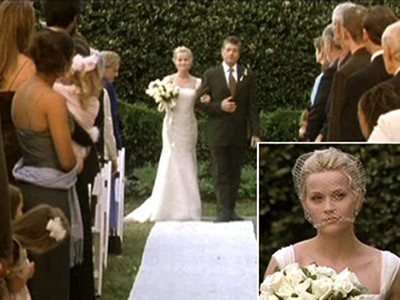 Beautiful Reese Witherspoon shows that a cage veil could be a wonderful look for a bride. A cage veil only covers the bride’s face and is secured at the back of the hairstyle. This veil is pure vintage style, but ever so modern. When compared to the traditional long veil, the cage veil is also a very elegant option. 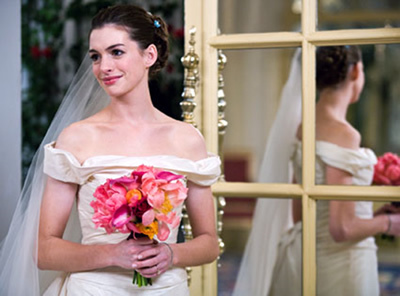 In the movie Bride Wars, Anne Hathaway is simply elegant with this bridal updo, which is complimented by a small blue hair pin that also represents the “something blue” that traditionally all brides should wear. The entire look is extremely personalized, chic and timeless. 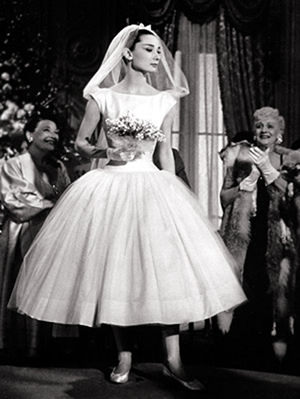 Famous fashion icon and a true inspiration for most fashion designers, Audrey Hepburn portrays a very elegant and feminine bridal look in this fun movie. She’s wearing a Givenchy ballet bridal dress, her hair is pinned in an updo and adorned with a beautiful bow, which is attached to a headband that accommodates the veil. Simply fabulous. In the movie Marley and Me, Jennifer Aniston wears a very casual bridal hairstyle, reminiscent of the style from the 60s and 70s. This type of hairstyle is extremely casual and is dominated by the fact that only part of her hair is secured on top, which determines the entire look. Although it may seem way too casual for any bride, it could be a great inspiration for a modern and informal bridal look. One of the most famous bridal movies is the comedy Runaway Bride, where Julia Roberts wears three different looks, with three distinct hairstyles. This hairstyle, however, is very natural and casual, which makes it the winner when compared to the other two. This type of bridal hairstyle is perfect for creating a relaxed and romantic look, ideal for an outdoor wedding. 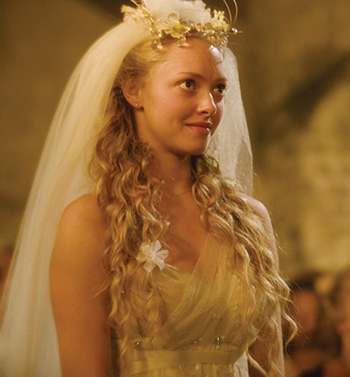 A splendid, almost fairy tale like hairstyle is what Amanda Seyfried wears in Mamma Mia. Her long flowing hair is naturally crowned by a grandiose veil, which adds a true queen’s crown to her simple, relaxed and enormous curls. In a movie where fashion plays a role almost as important as its characters, Carrie Bradshaw wears one of the most original bridal hairstyles of all times. Showing off a majestic blue feather, her hair is all pinned at the back of her head and molded in order to form a large roll, so that all the attention lies on the magnificent blue feather, as well as on the veil of this very modern and original bride.